With eight of the ten largest PR agencies in the world, including the top five, developments in the United States PR industry are bound to have some important effects on this sector globally. 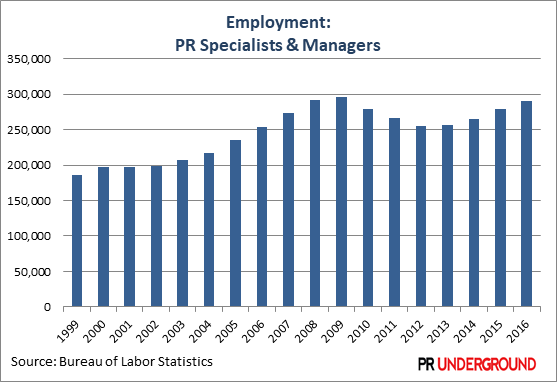 One of the key indicators of sector strength, job growth in the U.S. PR industry, continues its upward trend for the 4th consecutive year, according to a new report by PRunderground.com. 36,110 new PR jobs were added in the U.S. between 2012 and 2016, according to the latest employment figures released by the Bureau of Labor Statistics. For the same period, job growth was strong for both management and non-management positions, the former seeing 10,450 new jobs, while the latter 25,660. Historical trends put a different perspective on the industry’s growth. In spite of the robust job growth seen in the past few years, employment in the industry is still behind its peak pre-recession years. The financial crisis triggered major layoffs in the economy, which peaked in 2009, and the PR sector has not been spared by its effects. Current employment figures are still 5,000 jobs lower than its peak level, but there’s hope that by the next time the Bureau of Labor Statistics publishes its next set of data, the industry will recover all jobs lost in the financial crisis. Another interesting insight offered by historical employment trends is that companies and agencies in the U.S. hire less executive-level PR professionals now than 18 years ago. 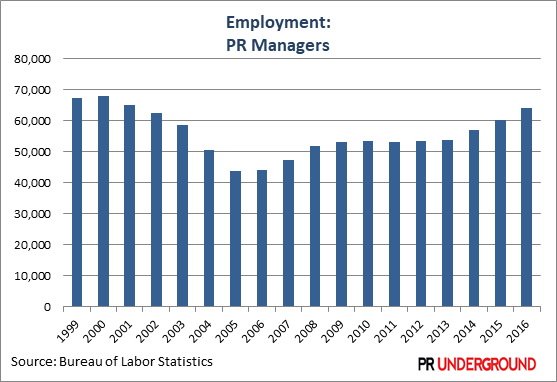 The number of PR managers employed in 2016 was 63,970 compared to 67,210 in 1999. While the sector has added over 100,000 jobs between 1999 and 2016, the job growth came from non-management level positions. There are many potential causes for this severe loss of PR management jobs. There is no doubt that companies continue to value the effectiveness of PR, given the overall strong job growth in the industry. But at an organizational level, many corporate communication departments are reporting to marketing, and, in many cases, PR professionals report directly to a marketing manager. According to the Holmes Report, more than half of PR professionals and 60% of marketing executives believe the two disciplines will be more closely aligned. Depending on which discipline dominates, this will generate redundancies for either PR or marketing management-level positions, which could further bite into the job growth for PR managers positions. The internet and technology have also decreased the need for as many PR positions. A PR team can successfully do their job using a combination of software and tools with much less staff. In the pre-internet era, PR teams had to physically create, print, and mail press kits, make thousands of photocopies, research press contacts manually, send faxes, track down actual coverage in physical forms and clipping services, and spend their days and manpower on many more time-consuming manual processes. Email, websites, social media, and software have eliminated many of these time-consuming tasks, all of which had to be done before 1999. Another culprit might be the growing number of responsibilities managers and senior executives are facing nowadays. Hay Group, a global management consulting group, reports that over time senior managers at large corporations have been made responsible for more and more people. More is done with less and companies have learned to thrive with a fewer number of executives relative to their number of employees. On the upside, more responsibilities have brought advantages as well. 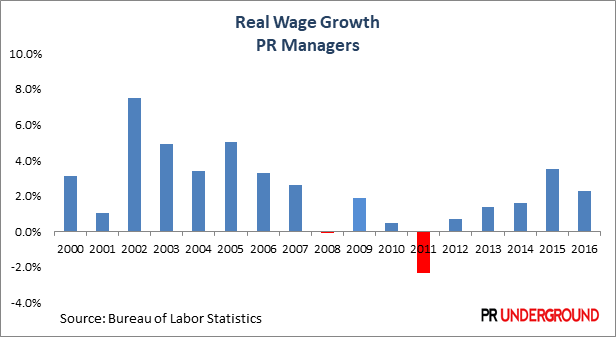 Salaries for PR managers have increased relentlessly over the past two decades and at a much higher pace than salaries for non-management level positions. A PR manager in the United States is earning on average $123,360 per year, which is almost twice as much compared to the $66,540 a PR specialist (non-manager) is making. The pay gap between PR managers and PR professionals has virtually exploded over the past 17 years. Back in 1999, a PR manager was expected to earn 40% more than their subordinates, while in 2016 a PR manager was paid on average 85% more than their subordinates. A PR specialist in the US is paid on average $32 per hour or $66,540 per year, according to the most recent data made available by the Bureau of Labor Statistics. PR specialists have seen their wages rise by 1.53% per year on average for the past nine years, but the increase has only been marginally higher than the inflation for the same period. 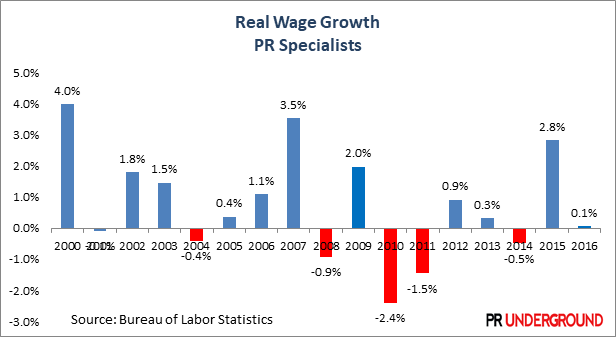 When adjusted for inflation, wages for PR specialists have increased by a dismal 0.09% per year over the past nine years. Entry-level jobs in PR have been the hardest affected by the financial crisis. Salaries for graduates and junior specialists, represented by those in the 10% and 25% income percentile, have seen a very modest increase from 2008. When adjusted for inflation, real incomes have actually fallen as inflation has increased at a higher pace than salaries have. PR specialists are not paid evenly across the country and data from the Bureau of Labor Statistics shows wide geographic differences in pay level. Earning on average over $94,000, a PR specialist from the Bay Area (e.g., San Francisco, San Jose) is paid twice as much as one from Oklahoma City, OK or Pittsburg, PA. High salaries in the PR industry are not confined to the Bay Area. If you work in PR, you are better off working in cities/area such New York, Washington D.C., Orange County, CA, North Jersey, or Providence, RI. However, many of these high-paying areas also command notoriously high living costs. When adjusted for local living expenses, it is PR specialists from Providence, RI, Sacramento, CA and Detroit, MI who are earning the highest wages compared to the local living wage.